Clump Weight: The first instrument to enter Lake Mercer was the Deep SCINI clump weight equipped with cameras that fed live video to the surface. A packed room of observers watched the Clump Weight descend through the borehole and enter into Lake Mercer. 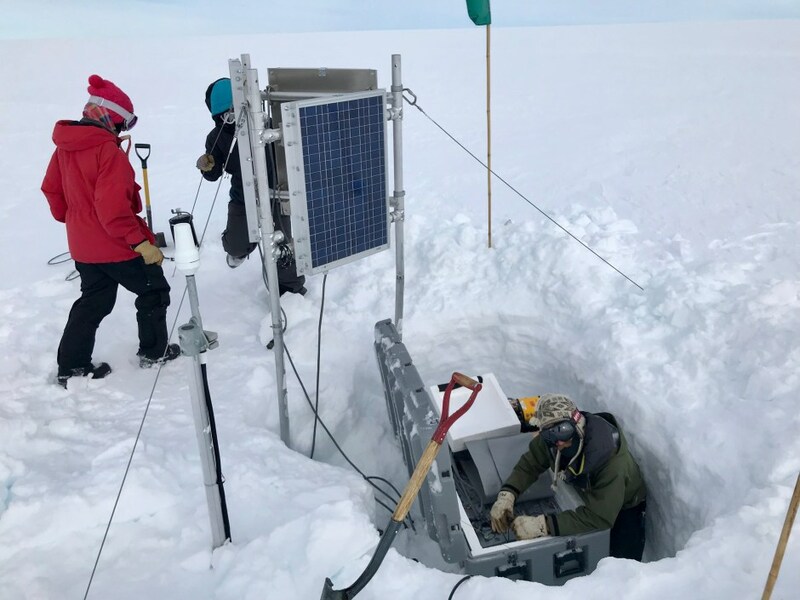 The lake water was very cloudy and filled with fine grained sediment particles and its bottom depth measured out to be 1,084 meters (about 3,566 feet) below the ice surface. There was a moment of tension as the clump weight initially got caught exiting the lake, indicating that the bottom of the borehole wasn’t quite wide enough. After a few tries the Clump Weight came through the borehole and up to the surface. Justin Burnett and Bob Zook send down the Clump Weight to capture the first images of the lake. Photo by Kathy Kasic, SALSA Education & Outreach. Viewing clump weight live images of borehole and Lake Mercer. Photo by Kathy Kasic, SALSA Education & Outreach. CTD (Conductivity, Temperature, and Depth) Instrument: Despite this, we went forward with the next instrument, which was the CTD, measuring the conductivity (to see how salty the water is), temperature, and depth of the water column. Lake Mercer was found to be 15 meters (about 50 ft) deep with a uniform fresh water column. Niskin Bottles: After the CTD, we deployed two 10L Niskin Bottles to collect water from the lake. The first had a cage surrounding it, which became stuck in the borehole, causing us to abort that deployment before reaching the lake. The second cageless Niskin reached the lake and collected a water sample from the center of the 15-meter water column. John Priscu with Niskin Bottle. Photo by Kathy Kasic, SALSA Education & Outreach. Because the clump weight and first Niskin bottle were stuck at different points in the borehole, The Drill Team decided to spend a day reaming (smoothing and widening) the borehole to be sure no more instruments would be caught in the hole.